We are celebrating Cheti Chand 2019 aka Sindhi New Year on April 7. India has a numerous New Year’s Day based on Hindu lunisolar calendar, which lists Chaitra (March-April) as its first month. Apart from Hindu New Year, Cheti Chand is also observed as birth anniversary of Lord Jhulelal or Ishta Dev Uderolal. Therefore, Cheti Chand is also called Jhulelal Jayanti. Sindhi Hindus across the country celebrate Cheti Chand with a lot of fun and fervour. Like any religious festival and auspicious event, people exchange greetings online. 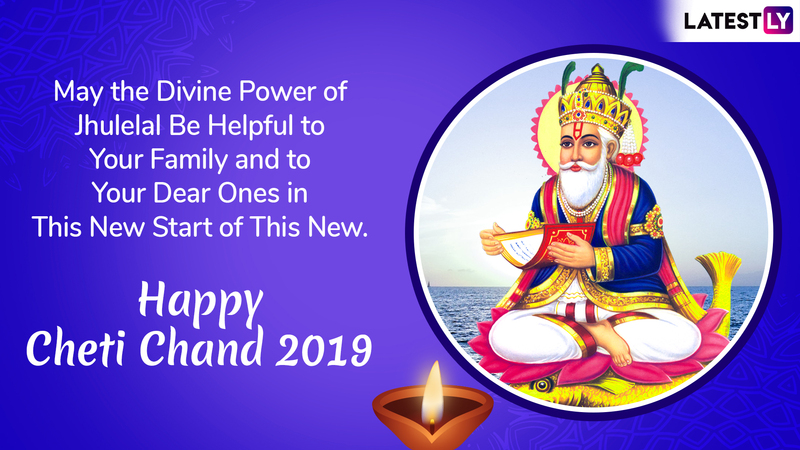 That’s why we present you with a collection of Cheti Chand 2019 messages, Cheti Chand WhatsApp Stickers, Jhulelal Jayanti images, Sindhi New Year wishes, quotes, SMS and more. 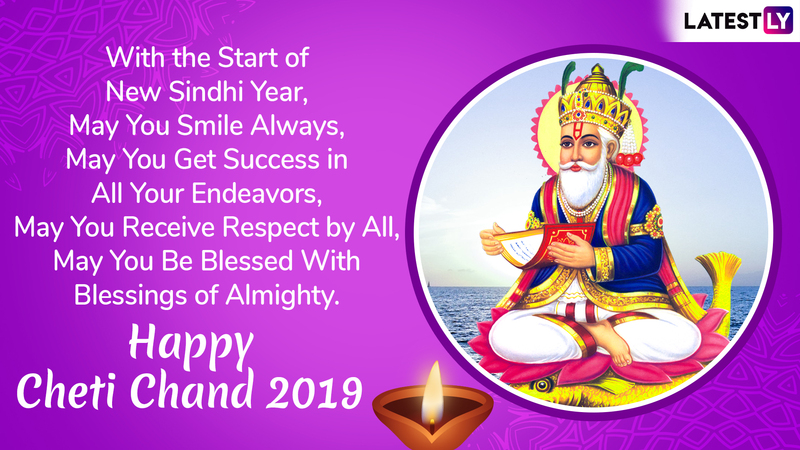 Cheti Chand Images & Jhulelal Jayanti HD Wallpapers for Free Download Online: Wish Happy Sindhi New Year 2019 With GIF Greetings & WhatsApp Sticker Messages. Jhulelal is believed to be an incarnation of Lord Varun, God of Oceans. According to the legend of Jhulelal, Uderolal is the most-revered deity or Ishta Dev among Sindhi Hindus after he saved the community from the tyranny of Mirkhshah. It is said Uderolal reprimanded the cruel king who forced Hindus to convert to Islam and told him both Hindus and Muslims deserved equal religious freedom. He is worshipped at the Shrine at Odero Lal in Pakistan's Sindh province by Sindhi Hindus while Sindhi Muslims venerate the shrine as the tomb of Sheikh Tahir. You can read in detail about Cheti Chand significance and history about Jhulelal Jayanti and Sindhi New Year. And if you’re looking for last minute greetings and messages to wish your family and friends, you will find it below. WhatsApp Message Reads: May This Cheti Chand Bring You New Spirit, New Beginning and New Prosperity. 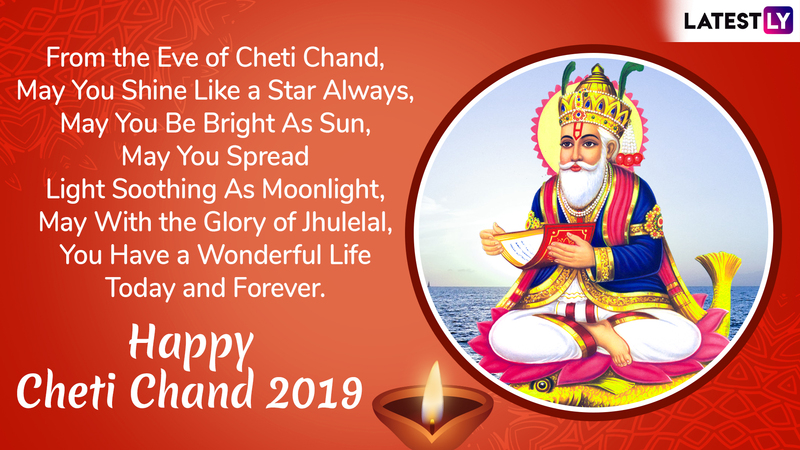 Wishing You Happy Cheti Chand 2019. 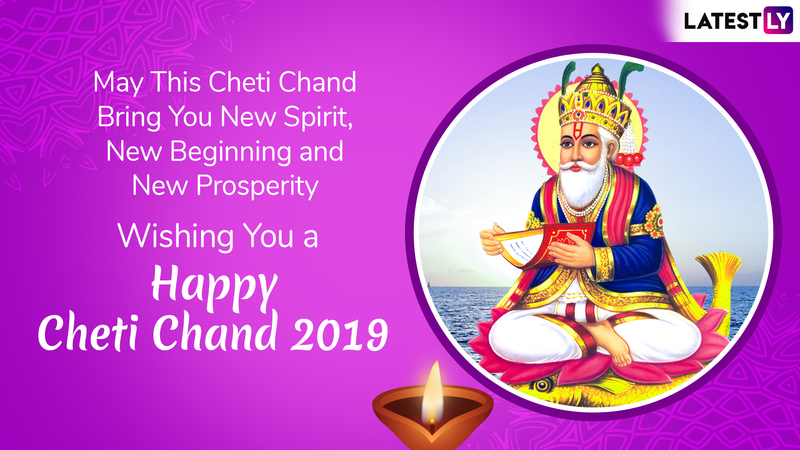 Cheti Chand 2019 Wishes in Sindhi: Image Greetings, WhatsApp Messages & Stickers For Jhulelal Jayanti And Sindhi New Year. WhatsApp Message Reads: With the Start of New Sindhi Year, May You Smile Always, May You Get Success in All Your Endeavors, May You Receive Respect by All, May You Be Blessed With Blessings of Almighty. Happy Cheti Chand 2019. WhatsApp Message Reads: May the Divine Power of Jhulelal Be Helpful to Your Family and to Your Dear Ones in This New Start of This New. Happy Cheti Chand. WhatsApp Message Reads: From the Eve of Cheti Chand, May You Shine Like a Star Always, May You Be Bright As Sun, May You Spread Light Soothing As Moonlight, May With the Glory of Jhulelal, You Have a Wonderful Life Today and Forever. Happy Cheti Chand 2019. We wish you and your family a very Happy Cheti Chand and Jhulelal Jayanti 2019. As the day is also believed to mark the beginning of the financial year, we wish you are showered with wealth, happiness and prosperity. Wish you a very Happy and Prosperous Sindhi New Year 2019.